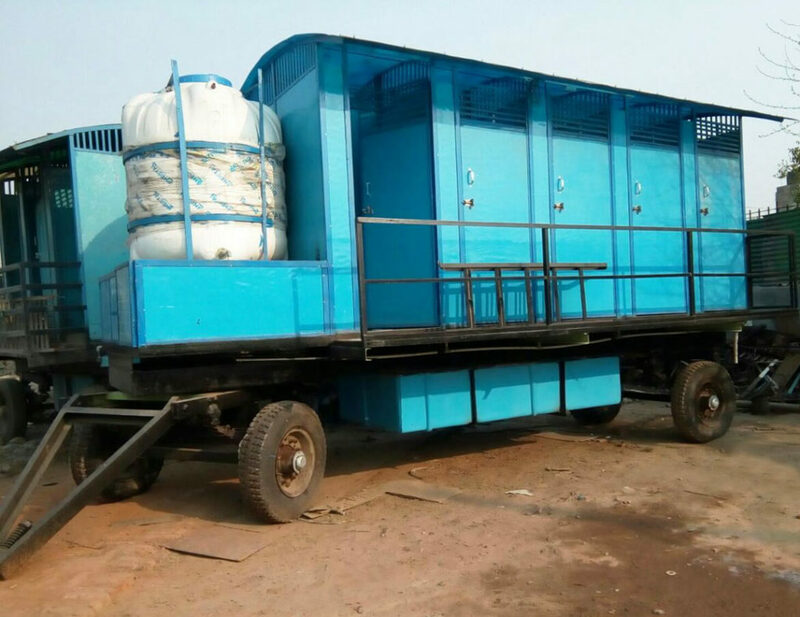 10 Seater Mobile Toilet Unit With NGAD Bio-Digester – Go Green Solutions Pvt. Ltd.
Base Frame shall be fabricated from M.S. Angle of size of size 150mm X 75 mm, 75 mm X 40 mm and 100 mm X 50 mm. 40 X 40 X 5 mm having round shape and projection and covered with transparent fibre glass sheet. Flooring Floor panel integrated with squatting pan, footrest and skirting will be FRP modeled. Bio-Digester: NGAD bio digester of FRP modeled approx 2800 & 1700 Itrs. capacity with adequate bio-cord assembly , bio-culture and EKOGEA Bio additives with disposal arrangement. Phyto Bed : One Phytobed of size : (L X W X H) 93 inch X 45 inch x 18 inch with suitable biomedia, bioculture and Phyto plants. Water Tank:: 1 No. Watertank of capacity 500 ltrs. Electric Fitting: one point in each toilet cabin with controlling of M.C.B. on each side ladies/gents. G.I. Fittings : Every toilet cabin with water connection of 15mm dia G.I. pipe and other fitting. 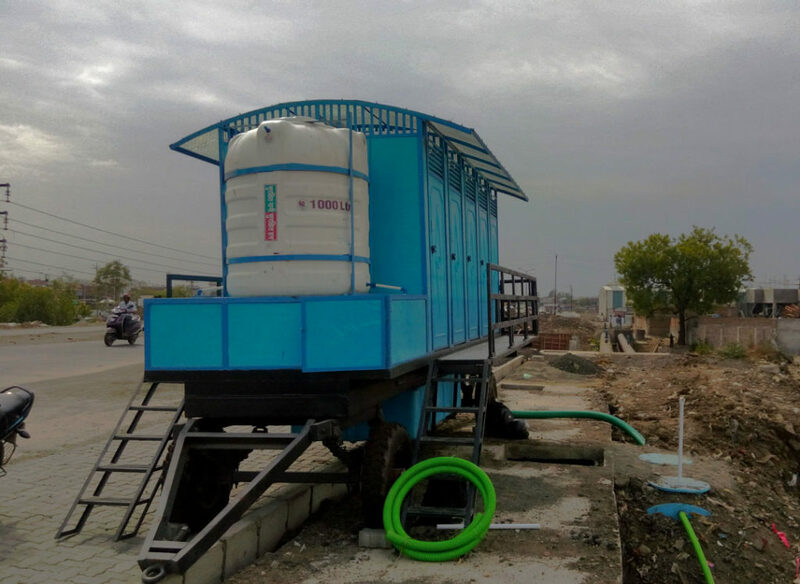 Connection: connection of each toilet with 110 mm dia PVC pipe of ISI mark with P- trap and other fitting and one connection of waste gap pipe. 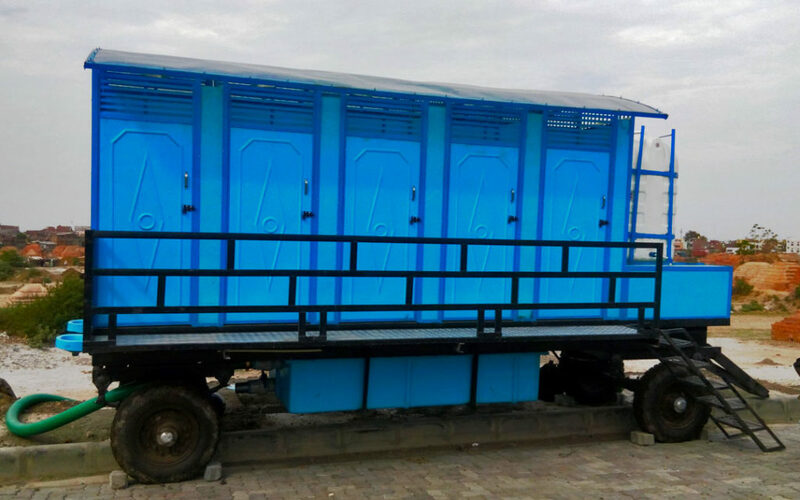 Trailer Specification : Chassis Four Wheeled chassis with Heavy duty turn Table made, Pay Load 6 Tones. Tyro No. : 2 front & 2 rear.